Our chartered sailboat docked at an island, as seen from the firepit near the beach. 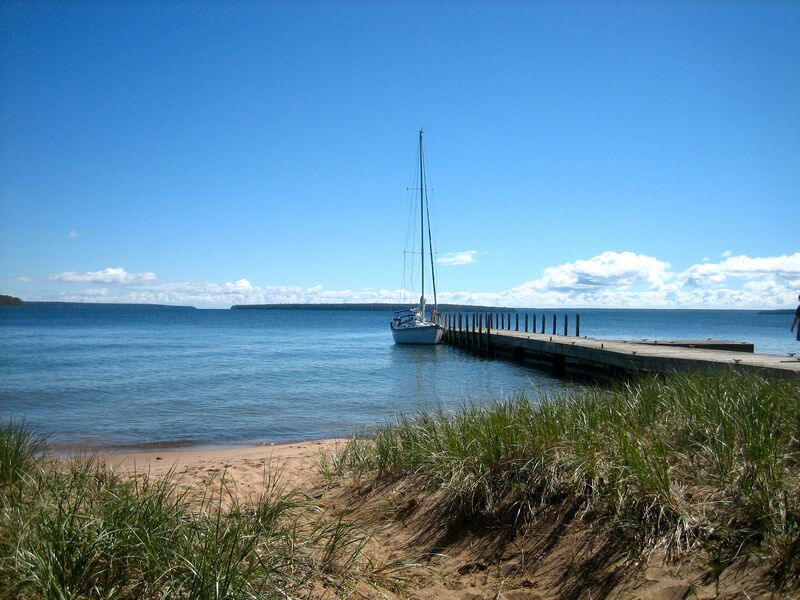 Some of my friends are experienced sailors, and I recently had the awesome opportunity to sail Lake Superior with them; specifically, we explored the Apostle Islands. There were a total of four of us guys on our chartered sailboat for four days in early September. I don’t know much about sailing, so I made my primary contribution be our food; I did the food shopping and the cooking of our evening meals including chicken fajitas, birch-grilled steak, and grilled pork chops marinated in salsa verde. We stayed on the boat every day of the trip; it was conveniently equiped with quite a complete kitchen, and even a propane-fueled grill over the stern. 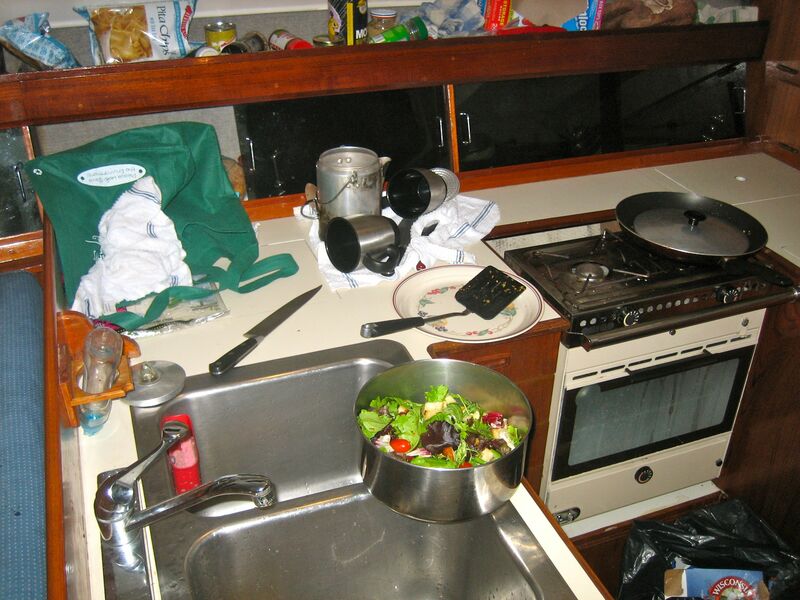 The sailboat galley with gimbaled stove. On one day we sailed to an island that had a dock in water deep enough for our keelboat, so that day we grilled ribeye steaks ashore over local birchwood from the boreal forest. 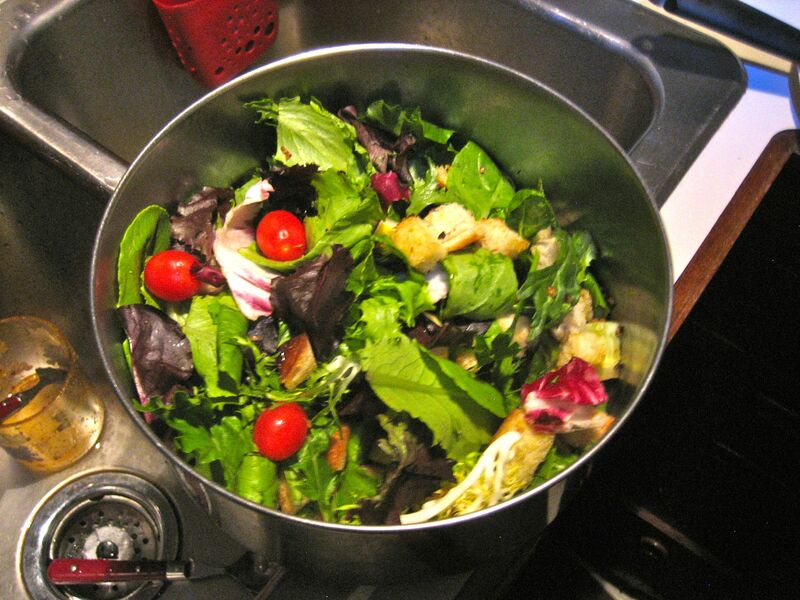 While we are all meat-eating men, we’re not savages. 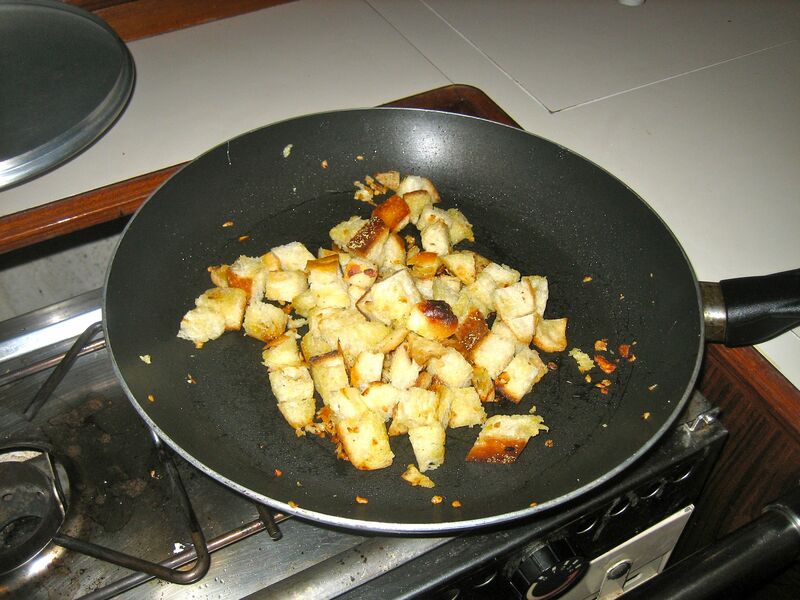 We accompanied the dinner with a salad with freshly-made croutons of diced sourdough bread browned in olive oil, minced garlic, and salt. 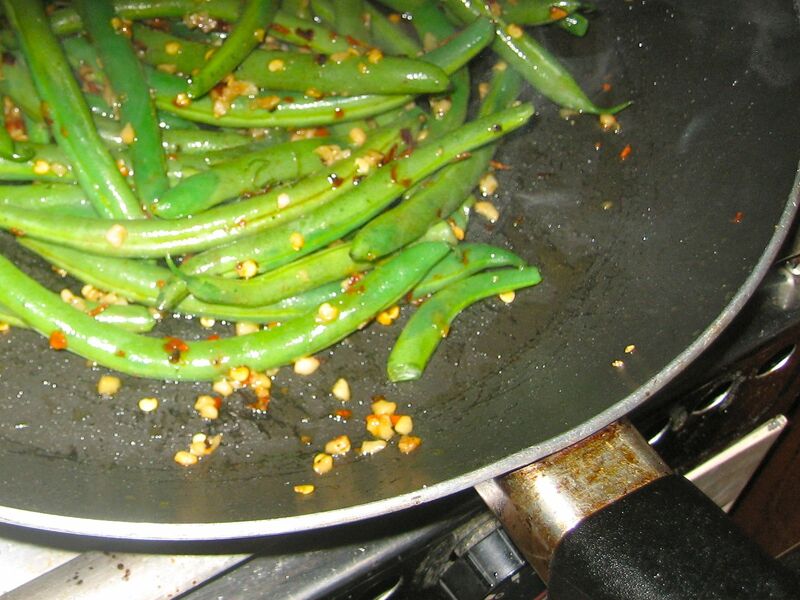 Our side dish was spicy green beans, similar to szechuan-style green beans. Red pepper flakes and garlic were soaked in olive oil for a while, then we sautéed whole, trimmed green beans in that spiced oil. 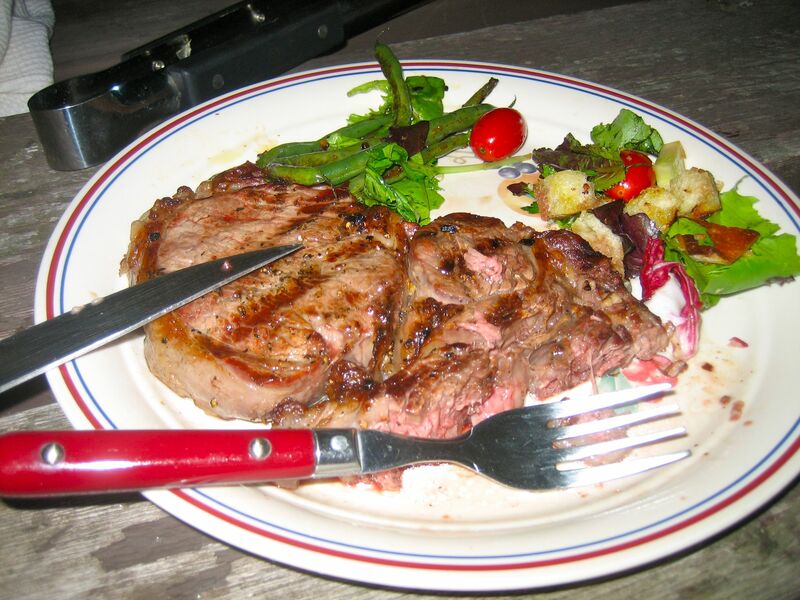 While I was aboard preparing the sides, one of my fellow sailors expertly grilled our thick ribeye steaks (rubbed with garlic olive oil, and minced garlic, salt and pepper) at the beach over a birchwood fire. They were excellent, as evidence by my eating before taking a photograph; grilling over wood makes a huge difference in flavor as compared to gas or charcoal. Ribeye steak grilled over birchwood, spicy green beans, and salad. Hi Matthew! No fresh fish this time… I really don’t know what fishing on Superior is like. We saw the commercial boats – chased by seagulls – that go for whitefish and lake trought, etc. though. ← Stuffed Tomatoes and Peppers for 18 people!